Once visitors to Rotorua adjust to the pungent sulphur smell in the air and the town’s overwhelming smorgasbord of cultural activities, you can actually really enjoy the place. It had been more than 10 years since I last visited this North Island geothermal tourist epicenter, and now, after meeting some of its people and soaking in some of its shows and attractions, I’m happy to report that it has become a world-class destination, and does so with panache and style. Back in the day, as a kid, my parents would take us to Rotorua for holidays. The locals back then regarded tourists as a necessary evil. Today, the local kids will greet you enthusiastically and politely and ask where you’re from, and the guides and front desk people at the tourist attractions use polished customer service techniques to woo their visitors. From past memory, many of the tourist attractions had become run down, always looking like they needed a coat of paint and repairs. And the performers at the staged cultural attractions seemed to be just going through the motions. Today, downtown Rotorua and the tourist sites sparkle, like a wand has been waved over them, giving a much-needed face-lift. And just as refreshing, the performers at the cultural shows put heart and soul into every appearance. Rotorua has come of age in the international tourist arena, big time. One of the finest and most dramatic examples this is found at the Tamaki Maori Village. Little did brothers Mike and Doug Tamaki, back in 1989, realize that their dream of portraying Maori culture to International visitors and New Zealanders alike, would prove so successful that they would eventually employ 150 Maoris to run and entertain at their Maori Village. But there was that pesky problem of lack of start-up capital. So Mike did the decent thing and convinced Doug to sell his prized Harley-Davidson motorcycle for a deposit on a 16-seat mini bus to shuttle the tourists to their immaculately re-created Maori Village, hidden in a stand of native forest. And as the saying goes, the rest is history. We board our bus, or “Waka”, which has somehow become transformed into an imaginary canoe, for our 20-minute journey to the Maori Village. Kahu Hapi, our “Korotiwaka” (guide) is a bald, handsome, 5-foot 8-inch, fun-loving slab of a guy, who would not be out of place in the All Black’s front row. His broad white smile is infectious. Soon, he has one of us elected as a chief to accept the challenge and powhiri (welcome) at the village, and has taught us enough important words from the Maori lexicon to keep us out of trouble. Later, Kahu, a 52-year old Rotorua native, tells me he’s a part-timer for the Village and has been working for them for 18 years. Kahu is a full time youth worker. “I work for the New Zealand Department of Welfare”, he says. “I drive the tour bus because I love meeting and entertaining people and ensuring they learn about our Maori culture. I want them to leave having had a great experience”. Kahu primarily works with Maori youth who have fallen under the influence of gangs, drugs, and alcohol. He enjoys working with children and “watching them grow and change their direction in life”. This man has a big heart. In a way, he’s still playing a part in helping his people deal with the problems that the “Pakeha”, or white man, brought with him. Kahu has us all fired up when we arrive at the Marae (village), and two hundred of us spill out of our busses to be herded around the edge of a wide semi-circular sandy dirt arena where we stand under an open tin-roofed shelter. It’s a gorgeous spot with a background of dense, impenetrable green native forest, from which guttural Maori chants are echoing. Soon, a fierce and well-muscled young Maori, resplendent with face and body tattoos, (called “Moko”) and twirling a six-foot long Taiaha (spear), emerges from the undergrowth and slowly gyrates his way to us, uttering menacing, deep throated challenges (“Karanga”). Placing a small branch (Teka) at the feet of our bus leaders, he backs away, watching them closely. The leaders accept the branch on our behalf, they press noses (the “hongi”—the Maori version of a welcome kiss) with the challenger, shake hands, and we become guests and part of the tribe. Entering the Maori village, serenaded by Maori women signing a welcoming song (Karanga), I am overwhelmed by the authentic ambience of the place. It’s set under a dark canopy of Matai, a tall black pine tree that soars high over our heads. Splitting up into groups we watch enactments of early Maori village life from war preparation games and skills to tattooing, and poi and stick games. The village is, as far as I am able to tell, a faithful replica; one that early white settlers might have seen in the late 1800s, with food huts standing atop thick poles to keep animals out and dwellings made from vertically stacked trunks of Ponga tree ferns. Later, I learn that this was the site of an ancient fortified Pa (Maori village). A while later we watch the unearthing of the Hangi food: a 3-foot deep pit where, 3 hours earlier, lava rock was heated until red hot, onto which baskets of food were lowered. After being covered with canvas and a thick layer of earth, the food is steam cooked. While the succulent smelling food is being prepared we’re seated in a dimly lit Wharenui (“big ancestral house”) to watch a dazzling display of Maori dances and songs. The show culminates in the fiercest Haka, or war dance, I have ever seen. Every visitor in the room feels the electric waves of passion and ferocity that emanate from the warriors as they flick their clubs and spears menacingly, roll their eyes back, and wave their tongues from their mouths. These guys are terrifying! Then the hangi is served in the large Wharekai (food house). Stacked high in large stainless steel trays, the moist chicken, lamb, beef, and fish are so well cooked that it literally falls off the bone and melts in the mouth. The fresh, sealed-in flavors burst across the palate. If you’ve never had Hangi food before, you’re missing some of the tastiest food in the world. After the closing ceremony and some singing, our bus trip back in the dark (it’s close to 10 p.m. now) is hilarious, with Kahu leading us in a boisterous medley of songs. He bellows “the wheels on the bus go round and round” as we revolve around a roundabout several times, holding up the local traffic. Kahu is enjoying this, with a typical playful Maori sense of fun. Earlier that day I’d had another enjoyable dose of Maori culture at the Whakarewarewa Living Thermal Village. This Maori enclave encapsulates this central North Island plateau’s wild geothermal activity and Maori culture in one concentrated visit. Passing under the white concrete archway that precedes the bridge to the village I see the memorial plaques to the Maori who fell in World War I and World War II—a reminder of their proud contribution to King and country. The Maori were regarded as extremely fierce soldiers and woe betide any Germans who got in their way when their blood was up. I feel a strong sense of nostalgia on the bridge. I’m well and truly strolling down memory lane as I remember how, in 1963, I had tossed coins down to exuberant Maori kids in the river, 10 metres below. They would dive for the coins, catch them, stick the coins in their mouths and burst to the surface yelling for more. The kids diving today are probably their grandchildren. I must have funded one boy’s first semester at university here, and I’m betting he also made the diving team. Moving on, I walk along white gravel pathways that meander past scenes from what I would imagine hell to be like. Huge clouds of hot steam and mist billow from jagged rents in the earth’s narrow crust; an overpowering smell of sulphur assaults the nose; and plumes of white geysers erupt from boreholes in the barren rock. Then we watch an enthusiastic Maori cultural performance by members of the Tuhourangi Ngati Wahiao people, with singing and dancing, skillful poi displays (where cricket ball size straw balls on string are waved about in tandem), stick coordination games, and of course, the Haka—all done by men and women of varying ages. One stunning young female performer, who looks no older than 17, turns out to be quite the overachiever. Ngahuia Putiputi Taniko Hona-Paku is in her final year of college at Rotorua Girl’s High School, where she is Head Girl. “I was born in Hastings, and then reared on my mum’s ancestral lands within the Whakarewarewa village”, she tells me. Ngahuia is descended from a long line of reknown village guides who have hosted visitors from all corners of the world since the late 1800’s. Clearly very proud and enthusiastic about her iwi (people), Ngahuia says, “I have been performing Maori cultural arts with my mother, sisters, cousins, aunties and uncles since I was 18 months old, and I am fluent in the Maori Language. I have the best job in the world”. Walking through the small Maori village gives an idea of how contemporary Maori live and pass on to meet their ancestors. There are nice cars in their yards and people snooze on the porches of their modest homes, out of the bright sunlight. A well-kept cemetery reveres famous Maori chiefs and guides with memorials. We visit an old church surrounded by boiling mud pools and, further on, see more astonishing geothermal handiwork: small terraces of white crystallised minerals beside pools of boiling water that bubble up from deep down. Thick yellow drifts of sulphur pool on the wet rocky surface. But now it’s time for some quintessential Pakeha (white man) Kiwi culture, and what better way than to watch a sheep shearing demonstration at the reknown Agrodome? Every male in New Zealand secretly wants to be a sheep shearer. This iconic breed of lean, hardy men with strong backs consumes copious amounts of beer after a long day of shearing two or three hundred sheep, in stinking hot corrugated iron sheds. Of such men are All Blacks made. Many Kiwis do not have the right stuff for the shearing life, so we get to live it vicariously through these showmen. Our energetic shearer is about 25 years young, with close-cropped hair, dressed in singlet and jeans. He hams it up gloriously for the appreciative crowd of Chinese, Japanese, Koreans, Australians, British, Germans, and others from practically all points of the compass. We’re shown the numerous sheep breeds and their commercial uses. The strains of sheep show their English and Scottish origins—Drysdale, Merino, Poll Dorset, Dorset Horn, Southdown, English Leicester, Border Leicester, Romney, and Cheviot—which somehow Kiwi farmers have managed to develop to a whole new level. Our shearer keeps the show moving along at a fair clip. We participate in a sheep auction. Kids delightedly feed milk to ravenous little lambs from plastic bottles. Upon whistle commands, loyal Huntaway sheep dogs, howling and barking with joy, clamber gleefully over the backs of the slightly nervous sheep. With a few strokes of the clippers, our shearer strips the thick woolen coat from an unsuspecting sheep in, well, two shakes of a lamb’s tail (sorry, had to mention this old Kiwi maxim). The Agrodome also offers tours of its 160-hectare working sheep and cattle farm on a tractor-pulled trailer, plus a variety of other activities. Tourist families will often spend a half-day here. It’s time to relax. At the Polynesian Spa I see how the area’s geothermal wonders have been magnificently harnessed to further the good cause of New Zealand tourism. Perched right on the edge of misty, green, Lake Rotorua, the Polynesian Spa is rated in the world’s top ten medical spas. Landscaped with native flora, rocks, and small cabanas, and panoramic lake views from all angles, the Polynesian Spa offers several intimate, deluxe private mineral spring water pools, plus public pools—all of differing sizes and temperatures (36 degrees C to 42 degrees C). Hint: start in the cooler pools and work up to the hot ones. Boasting a list of spa therapies as long as your arm, (anyone for mud body polishes, massage therapies of every stripe, facials, mud body wraps, exfoliation, back therapy, water therapy? 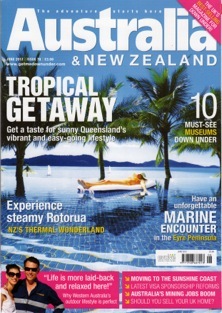 ), the spa ranks as a Rotorua must-visit. You’ll find plenty of friendly Kiwi families here, as well as the usual throng of international visitors. Soaking in the hot water, overlooking a breathtaking view is the essence of bliss. To complete your Rotorua experience, stay in the historic Princes Gate Hotel that the town was built around. What makes this sprawling white Victorian style hotel so special? It’s the highest rated and most exclusive hotel in Rotorua (5 star Guest). It’s also located at one of Rotorua’s finest addresses—directly opposite the Government Gardens. Each room is lavishly decorated in Victorian era theme style and if proud owners and hosts Brett and Vlasta Marvelly are free, they’ll be happy to give you a tour. After working for the Hyatt chain for several years, Brett decided to make his own destiny by purchasing the hotel 26 years ago. Originally from Wellington, Brett came to Rotorua with his family when he was 12 years old. Often working 70 hours each week, he says, “I enjoy meeting people and ensuring that their stay is special”. And special it will be. Chances are you’ll end up taking high tea here, or dining in the hotel’s gourmet restaurant (try the slow roasted New Zealand lag of lamb with mint sauce, Manuka honey glazed ham, fresh New Zealand green-lipped mussels, or Clevedon oysters). Or you might take in an opera or Broadway show in its main lobby. A walk through the Government Gardens is mandatory for all tourists, as you take in the Art Gallery, Polynesian Spa, nine-hole golf course, the history museum, and immaculately landscaped gardens. From my visit to Rotorua, it’s clear that this mid-sized town of 70,000 people has come a long way since my childhood. As the heartland of New Zealand’s Maori culture, with one third of the population Maori, you’ll get a serious dose of this fascinating race’s heritage, delivered with flair. Rotorua’s mysterious and frenetic miasma of bubbling and glopping mud pools and boiling water springing up from the ground—seemingly in everyone’s back yard—is intriguing enough to satisfy even the most jaded sightseer. And finding real Kiwis from all walks of life is still easily done here. Entry fee: starting from $25 for adults.